Congress was concerned enough about these dangers that it set mining apart from other workplaces, and actually mandated periodic inspections of four times a year for underground mines and twice a year for surface mines. Other dangerous industries — whether oil and gas drilling, timbering, or construction — don’t have this mandate. Workers in those industries can go years without ever seeing an inspector from the U.S. Occupational Safety and Health Administration. Over the years, MSHA has had enough problems making its “twos and fours”, and has only recently began to build back up an inspection force that saw huge staffing and budget cuts that paved the way for a series of mining disasters, from Sago, Aracoma and Kentucky Darby, to Crandall Canyon and Upper Big Branch. And we’ve learned from repeated reports published only after mining disasters (see here, here and here) what can happen when MSHA isn’t on top of things in the nation’s mines. “The Federal programs that adjudicate injured workers claims are closed. The State programs are beginning to feel the impact of the that lack of information flow from the collateral medical lien resolution process so resolution of claims are now stalled. New Federal programs enacted under The SMART Act, to expedite the lien resolution programs have been halted in the public comment phases, and may face further delay in implementation and regulatory amendment. How does the governmental shutdown impact OSHA enforcement and contested cases? How will shutdown affect OSHA’s silica proposal? It looks like the shutdown could extend beyond a few days so we’ve gathered information and resources, occupational health & safety edition. We’ll update as we find additional news and resources. Chemical Safety and Hazard Investigation – 3 out of 20 employees will remain active, but there are no investigators to respond to emergencies. The World Trade Center Health Program and the Energy Employees Occupational Illness Compensation Program can continue to operate because they draw from alternate funding sources. CBS News reports on the National Institute of Health, already reeling from $1.5 billion in sequester cuts, must now shut its “hospital of last resort” and must turn away some 200 people, about 30 of them children, who want to participate in experimental treatment. Why isn’t there a workers’ comp app for that? So Peter is right on the money (as usual) with his “Workers” Comp App Store” reference. So if you want to compile a list of trustworthy insurance, business, or workers comp apps for your workforce, this might be a good tool to work with. Acuity’s Loss Reporting App – this is a YouTube video talking about the app. MedGadget’s Best of 2012 – features some amazing apps. The blog is a great source for emerging medical technologies. Many of the apps we see are ghost towns – few reviews, little traction. Still, we applaud the pioneers for forging the way because in our experience, insurance as an industry is infamous for leading from behind when it comes to adaptation to new technologies. Policy Wonks, Lend Me Your Ears! The Insider is very much looking forward to the Workers Compensation Research Institute (WCRI) annual conference, taking place on February 27-28 in the virtual epicenter of wonkiness, Cambridge MA. There is always much food for thought in these annual gatherings of insurance execs, state officials, policy makers, attorneys, medical specialists, employers and safety/loss control practitioners. – The Opioid epidemic: treatment protocols involving the generous and prolonged distribution of opioids are destroying lives across the country. Why are so many doctors so clueless about the proper use of pain killers? Whatever happened to “do no harm”? WCRI’s head honcho, Dr. Richard Victor, will host a discussion on health care policy involving (the presumably liberal) Howard Dean and (the assuredly conservative) Greg Judd. The dialogue might not equal the fireworks of July 4th on the Esplanade, but it might come close. The Insider will be listening closely for any indications of that rarest of phenomena: a common ground. Last year, Dr. Victor concluded the conference with a discussion of the “gorilla in the room”: the enormous and perhaps insoluble problem of structural unemployment among the 20 million people who lost jobs in the recent recession. For many of these people, especially those in their 50s and 60s, there is little prospect of returning to jobs with anywhere near the same rate of pay as before. Many will find themselves lost in the new economy, cobbling together part-time employment without benefits, while struggling to hold onto housing where mortgages exceed the value of the home. Tough times and, so far, not much in the way of effective solutions. This year Dr. Victor will have to find some other animal analogy to glean lessons from history: Giraffe in the closet? Rhino in the den? He tells us that the lesson might have something to do with the first century Ephesians, toward whom St. Paul addressed some rather famous snail mail. While some might find such a teaser a bit obscure and full of religious overtones, the Insider looks forward to the story. Indeed, we look forward to this year’s entire conference with great anticipation. There are few things better for policy wonks – our people! – than listening to the latest research from WCRI. Diligent note-taking will be in order. If you count yourself among those with wonkish tendencies and you haven’t signed up yet, you’d best jump on it immediately. If you have any questions about the conference, contact Andrew Kenneally at WCRI: 617-661-9274. Is your organization on the telework train? Telework.gov is the official website of the federal government’s telework program. While the site pertains specifically to the federal work force, it provides an interesting case study and reference point for employers on issues of policy, practice, training and more. Telecommuting and -based work opens a lot of compensability issues should an injury occur so policies and procedures need to be thought out carefully in advance.One of the best articles on the topic that we’ve seen is John Stahl’s Mobile Workforce Issues: Home-based Employees and Traditional Workers Subject to Same Standards, which covered a session on the mobile Workforce at last November’s Workers’ Compensation & Disability Conference. Mark Noonan also has a good overview of some of the issues related to telecommuting and workers’ comp, including tips to avoid claims. 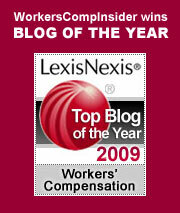 Telecommuting: Are Employers Liable for Home Office Injuries? Dr. Jaan Sidorov has posted A Brainy Health Wonk Review on Health Reform, the Affordable Care Act and Lots More! at Disease Management Care Blog. Health Wonk Review is on an abbreviated summer schedule but the wonkers still have a lot to share and Jaan does a great job dishing it up – check it out. From time to time, we update our blogroll with new blog finds – and we also clear out some of the less active blogs. It’s exciting to see such a thriving workers comp and insurance community online – back in 2003, when we started, it was a pretty lonely place! Check them all out under “Business Weblogs” in our right hand sidebar. We also have a variety of other useful tools if you haven’t checked them out yet! Will the extreme heat that has plagued the nation in June and July continue on through August? If so, there’s a tool that might provide some relief — and safety — for outdoor workers. 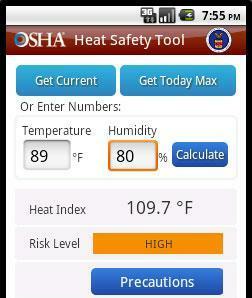 OSHA has a Heat Safety App that allows workers and supervisors to calculate the heat index for their worksite and, based on the heat index, displays a risk level to outdoor workers. It combines heat index data from the U.S. National Oceanic and Atmospheric Administration with the user’s location to determine necessary protective measures. Once a worker has determined the risk level, they can then access information about protective measures that should be taken for that risk level to prevent heat-related illness. These include reminders about drinking enough fluids, scheduling rest breaks, planning for and knowing what to do in an emergency, adjusting work operations, gradually building up the workload for new workers, training on heat illness signs and symptoms, and monitoring each other for signs and symptoms of heat-related illness. The free app is available for iPhones, Androids, and Blackberrys in English and Spanish. Access other tools and information in OSHA’s Campaign to Prevent Heat Illness in Outdoor Workers. USA Today has a story on how businesses are adapting to extreme heat and drought. It includes mention of some new “personal cooling system” technologies such as CoolWare and Polar Products, which offers some “Body Cooling Systems.” We can’t personally vouch for any of these because we haven’t tried them – but there are still several weeks to summer yet! Here’s a grab bag of apps for health & safety, human resources, insurance news – and even for ADA job accommodations. EH&S Apps for All Seasons – Occupational Health & Safety compiled apps that have particular relevance to safety, health, and environmental professionals – and risk managers too, we might add. These range from weather and traffic alerts to tools for chemical safety, first aid and emergency response. Top 5 Risk Management Apps – apps for insurance terminology, insurance publications and a mobile flood map. Apps for ADA Accommodations – HR Daily Adisor offers a variety of suggestions from the Job Accommodation Network for apps that address speech, hearing and visual impairment. 10 Apps That Can Save a Patient’s Life – Emergency Monthly scoured the MedGadget archives to compile the top 10 smartphone applications that can save a patient’s life … before they get to the emergency department. The 10 apps presented have been grouped into the four primary categories: workflow, emergency response, vitals, and diagnosis. 10 Mobile Apps That Promote Safety – SocialTimes offers a roundup of apps covering emergency preparedness, driving safety, alerts, first aid, and medical diagnostics for communications between patients and physicians. In HR? There’s an App for That – a roundup of apps from SHRM for recruiting, analytics, time-and-attendance tracking, performance feedback and more. It’s a pop quiz style risk roundup this week where you can match wits with the riskmeisters. The Notwithstanding Blog hosts the Cavalcade of Risk #149: Single Best Answer edition. In other matters, we will use this week’s roundup here at Workers Comp Insider to highlight some useful gizmos and gadgets that have been accumulating in our bookmarks folder: a grab bag of work-related mobile apps and calculators that we hope you’ll find useful! DOL data apps – Backed by prize money, last summer the Department of Labor issued an Occupational Employment Statistics challenge to developers to use DOL data in innovative, creative, and useful ways that would empower job seekers and consumers. Winning apps were recently announced – they include job trackers and occupational wage watchers – but our favorite is Eat Shop Sleep, an app that allows you to geographically shop for hotels and restaurants, and to narrow your results based on health and labor violations, as well as local reviews. The DOL itself offers a few mobile apps – a labor statistics tool, a timesheet, and an OSHA heat safety tool. See the full menu of USA.gov features various mobile apps – a few that look particularly helpful include PTSD Coach, MedlinePlus Mobile, and U.S. Federal per-diem rates. And we can’t resist pointing out the MEanderthal, a Smithsonian app that allows you to upload a photo and morph into a neanderthal – not particularly work-related, unless you want to create an unusual portrait bulletin board for your work team. (See a fun video of MEanderthal in action). Accessibility App – Another app development challenge sponsored by the Knight Foundation and the Federal Communications Commission yields a tool with great potential for people with disabilities. Access Together, is a crowd-sourced Foursquare-style app, which incorporates user information about accessibility of various locations. All answers will be saved and become part of a searchable dataset, map and open API to be used by people with and without disabilities. Distracted Driving – DriveSafe.ly is a mobile application that reads text (SMS) messages and emails aloud in real time and automatically responds without drivers touching the mobile phone. DriveSafe.ly bills itself as “the solution to texting while driving.” It’s available in either a personal or a business/enterprise edition. Push Pull Carry Calculator – Canada’s WorkSafeBC is a great source of quality health and safety resources. Check out the Push Pull Carry Calculator, a tool designed to help prevent musculo-skeletal injuries. Ergonomics Cost Benefit Calculator – The Puget Sound Chapter of the Human Factors and Ergonomics Society has developed an Ergonomics cost-benefit calculator that helps you to estimate ROI by comparing three intervention options that offer estimates of benefits and payback periods. Diabetes cost – The Agency for Healthcare Research and Quality (AHRQ) has created Diabetes Cost Calculator for Employers, an evidence-based tool that employers can use to estimate how much diabetes costs them and the potential savings that would result from better management of diabetes. In a similar vein, see Blueprint for health, a free web-based tool for making value-based decisions for health and productivity management. This tool was developed by the Health as Human Capital Foundation in collaboration with ACOEM, and the National Business Coalition on Health (NBCH). R.O.I. – Wellness Return on Investment Calculators are designed to help you to estimate the effect that a good wellness programs can have on health care costs, absenteeism, and presenteeism. For another tool variation on the theme of wellness program ROI, see the Calculate your Savings. The cost of doing nothing – Quantifying the Cost of Physical Inactivity Calculator estimates the financial cost of physically inactive people to a particular community, city, state or business. The site also provides companion resources and information to re-allocate resources and plan for healthier workplaces and communities that are more supportive of physical activity.